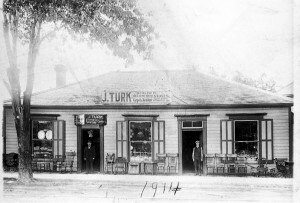 Turk’s was opened in 1902 by Jacob Turk, a Jewish settler who had come to Hamilton from Russia (by way of New York City) in 1889. His is one of the few businesses in this city to survive from the early part of the twentieth century. Around 1900, he and his wife Ann, whom he had met in New York, opened their first store in Kingston, a second-hand shop, at 398 Princess Street (now the Mekong Restaurant). The store was stocked with furniture, stoves, and other household wares. It featured beautiful old chairs and tables, including some in the styles of Chippendale and Sheraton. With his horse and wagon, Jacob traveled as far afield as Rochester, NY, peddling dry goods while casting about a discriminating eye for resalable treasures. A founding member of Beth Israel Synagogue, he was—coevally with Simon Oberndorffer—an active member of the Oddfellows Relief Association. Jacob’s wife Ann was also very involved in Beth Israel as a member of the women’s Zionist organization Hadassah. In fact, the first Hadassah Bazaar (an annual fund-raising event) in Kingston was held in the window of this store in 1953. The second Hadassah Bazaar was held at the site of their original store at 398 Princess Street, which was at one time the Kingston Oddfellows Lodge). Across the street, at 284 Princess (now the Little Saigon restaurant), stood the Kingston Bargain Centre. It was run by Morrie Smith and Percy Robinson, later the proprietors of S&R, before being destroyed by fire in the 1950s.